A ghost "is the soul or spirit of a deceased person or animal, taken to be capable of appearing in visible form or otherwise manifesting itself to the living. Descriptions of the apparition of ghosts vary widely: The mode of manifestation can range from an invisible presence to translucent or wispy shapes, to realistic, life-like visions. The deliberate attempt to contact the spirit of a deceased person is known as necromancy, or in spiritism as a séance..."
A ghost = "A supernatural being, such as a ghost: apparition, bogey, bogeyman, bogle, eidolon, phantasm, phantasma,phantom, revenant, shade, shadow, specter, spirit, visitant, wraith. Informal spook. Regional haunt. See beings, supernatural." A spirit = "any being imagined as incorporeal or immaterial, such as demons or deities." Ghostbusters, Ghost Busters or Ghostbuster = "Someone who participates in ghost hunting or paranormal investigation." to haunt = "To inhabit, visit, or appear to in the form of a ghost or other supernatural being." A ghostwriter "is a professional writer who is paid to write books, articles, stories, reports, or other texts that are officially credited to another person." "Arabella Stuart, a cousin of James I who fell out favour when she married without permission, is also said to haunt the Tower of London..."
and making sure that you’ll stay awake and eat all your candy to calm your nerves..."
- "a huge Victorian mansion filled with computer controlled animatronics, digital sound , lighting and fog, detailed rooms, custom soundtracks, and a host of professional actors." Ghost stories - With glossary, activities, audio, notes & links to original text. "This includes the intro from Alfred Hitchcock and the story The Haunted and The Haunters." "This includes - The Magician and Johnny Takes a Dare, with both featuring intros by Alfred Hitchcock." "with intro and the short story - The Open Window." "with Alfred Hitchcock intro and the short story - The Helpful Hitchhiker." "with the story - Jimmy Takes Vanishing Lessons and intro by Alfred Hitchcock." A lost man strays into a local barn dance and finds himself dancing with a ghost. Even death can't keep Chattanooga from his cigars! The vengeful ghost of a murdered girl haunts an alley. From Spooky Canada. Sam Gibb accepts a dare to stay in a haunted house, never expecting to meet a ghost. Pecos Bill takes on several hundred ghosts in the most haunted house in the West! From Spooky Southwest. Sam agrees to spend the night in a haunted house to rid it of a terrible ghost. Excerpt from Spooky Texas. A young man plays tug of war with a mischievous ghost haunting his house. From Spooky New York. An old man's ghost turns the tables on two little boys who played tricks on him when he was alive. Story comes from Spooky New Jersey and is read aloud by author S.E. Schlosser. Haunted houses : "Fill in the blanks with the words in the boxes." "In the kitchen, on the stove. This information gap covers prepositions, furniture and rooms in a house." "The purpose of this WebQuest is for you to become either a ghost hunter or a paranormal scientist. By taking on the role of the person you choose to be, your final task will be to write a newspaper article supporting your educated opinion. You will come to this opinion by following the process of the WebQuest." 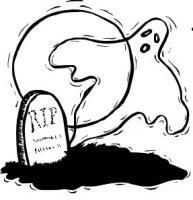 "This WebQuest gives you the possibility to investigate the mysterious and fascinating world of ghosts! Surf the Internet to find as much information as possible on the most haunted places in Britain. After this, you will promote your findings on this magical world and present it orally to the rest of the class. Make it real by creating pamphlets and brochures!..." "Dare you enter the Haunted House? Can you find the things you need for your magic spell?" "I'm pale as a ghost"
Chinaman's chance - "Also, ghost of a chance. An extremely slim chance, a hopeless undertaking. Both versions are most often put negatively, as in He hasn't a Chinaman's chance of finishing the work in time, or They haven't a ghost of a chance to get as far as the playoffs." Give up the ghost = "Die, as in At ten o'clock he gave up the ghost. This expression, which employs ghost in the sense of "the soul or spirit," may itself be dying out." The sad intangible who grieve and yearn...."
"I was an airplane mechanic stationed in England in 92. I was told when I first arrived to my shop that England is the most haunted country on earth..."
"is a popular short story by Oscar Wilde, widely adapted for the screen and stage." "The sentinels inform Horatio that they have seen a ghost that looks like the dead King Hamlet. After hearing from Horatio of the Ghost's appearance, Hamlet resolves to see the Ghost himself. That night, the Ghost appears again. It leads Hamlet to a secluded place, reveals that he is the actual spirit of his father, and discloses that he - the elder Hamlet - was murdered by Claudius' pouring poison in his ear. The Ghost demands that Hamlet avenge him; Hamlet agrees, swears his companions to secrecy, and tells them he intends to "put an antic disposition on" (presumably to avert suspicion). Hamlet initially attests to the ghost's reliability, calling him both an "honest ghost" and "truepenny." Later, however, he expresses doubts about the ghost's nature and intent, claiming these as reasons for his inaction..."
"At the banquet, Banquo's ghost enters and sits in Macbeth's place. Only Macbeth can see the spectre; the rest panic at the sight of Macbeth raging at an empty chair, until a desperate Lady Macbeth orders them to leave." A History of Ghosts on Film - "Let's take you inside a paranormal picture show." "The first “Ghostbusters” film featured four funny men as lead characters. The 2016 version has four funny women as its lead characters. In the films, the group hunts ghosts and protects the living." "a 1984 American comedy film written by co-stars Dan Aykroyd and Harold Ramis about three eccentric New York City parapsychologists-turned-ghost exterminators." "a 1989 science fiction comedy film and is the sequel to Ghostbusters. Produced and directed by Ivan Reitman, Ghostbusters II follows the further adventures of a group of parapsychologists and their organization which combats paranormal activities ("ghostbusting")." "a 2007 superhero film written and directed by Mark Steven Johnson. Based on the character of the same name which appeared in Marvel Comics, the film stars Nicolas Cage as Johnny Blaze, a stunt motorcyclist who morphs into the demon vigilante Ghost Rider." When Miles recites a poem invoking a "lost lord" to rise from the grave, Miss Giddens (the governess) concludes that the ghosts of Quint and Miss Jessel inhabit the bodies of the children so they can continue their relationship. She is determined to rescue them from this possession..."
Can I have a vodka, please ? I think you better call ghostbusters"